Opening Sunday June 5th, 3-5:30pm with a discussion by Lia Halloran, Kip Thorne and Sterl Phinney. Exhibtion runs till December 18th, 2016! We are just a few days away from the start of the install of over 110 works over almost 4 stories at the Cahill Center for Astronomy and Astrophysics designed by Thom Mayne. Last weekend we had our final walk through and mock up exhibition plan with the very talented David Ross, from Frederick and Fisher Partners Architects. The exciting architecture will pose a challenging install but our layout is set, catalogs and cards on their way and the opening is just around the corner on Sunday, June 5th form 3-5:30pm! After putting Henrietta aside (not to worry, we have some plans to repurpose her [perhaps not the best choice of words, there]), all of us settled on the fact that the sun was the light source to use. A smaller print exposes in the sunlight as I top off the first water bath. Because the cyanotype emulsion we brush onto the paper to make it “photographic paper” is only sensitive to certain wavelengths of ultraviolet light, and since readily available manmade UV lights are only available in lower wattage bulbs, it makes sense that the single object responsible for the entirety of the world’s sunburns would be the proper light source for our project. If we wanted to use Henrietta, we would have to wait well over an hour for each exposure — and that would be after retrofitting her with at least eight more UV lights (I’m slowly discovering that “retrofitting” is not a term nor a subject amenable to the art of personification...this could get sticky). With the sun, we only need eight to 14 minutes depending on the time of day. With this in mind, testing soon began in direct sunlight. This process is something with which we had great experience. Lia had precise notes on past exposure times at varying hours of the day. We had done plenty of test in the past. We had the same recipe for creating our cyanotype mixture. 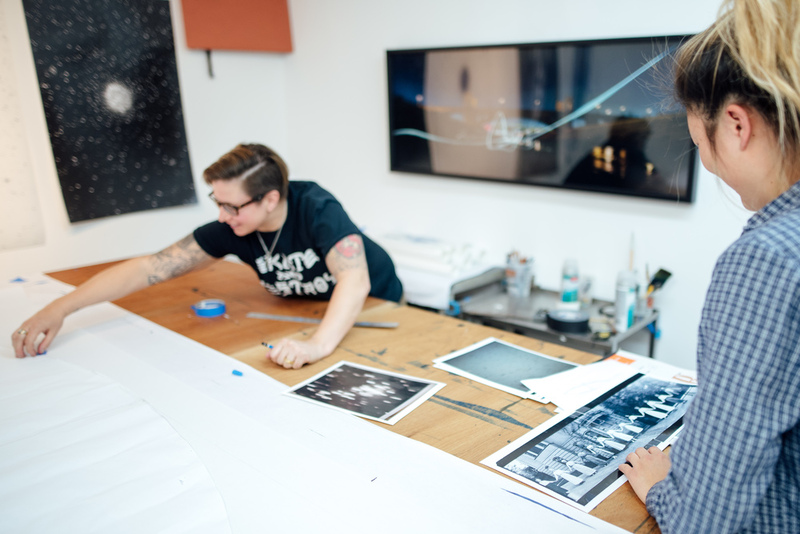 Two large-format prints had already been completed, framed, and shown in Los Angeles with this process. This was supposed to be easy. This was supposed to be easy. Printing every Friday and Saturday (we may have even thrown in a Thursday during Spring Break), an entire week elapsed over just two actual days of printing. And four printing days after our first sunlight tests, we had yet to produce one viable print. The first day, we realized the three giant bins that we ordered (which were supposed to be large enough to fit the mesh frames we built to support the prints for drying) tapered ever so slightly toward the bottom and were simply too small for our washing system. The UPS guy came to pick those up, and we ironically had two smaller bins ordered. The opening diameter was the same, but since these bins were shorter, they didn’t taper as much until reaching the bottom point in the bin. A day of not being able to wash large prints is a great day for testing and printing smaller ones. But our prints were browning or yellowing or not clearing the green-yellow tinge of cyanotype emulsion in the whites. The blues were washed out and tired. Something was missing. We narrowed it down to the lack of citric acid. We added just a couple drops to the mixture, and boom! Deep, rich, ultra-dark blues. Rinse the print, hydrogen peroxide bath, rinse the print again, hang it to dry. Again, the browning returned over the course of the drying process. Something was missing. Lia gets a shot of us all, completely perplexed by why our prints continue to look washed out and brown. At this point, we were at a standstill. We were half-way through our fourth or fifth day of actual printing. We remixed three different formulas to troubleshoot any possible mistakes. And then we remembered Lia’s prints that were finished, framed, shown — they were perfect. Lia’s previous prints with the same mixture we used this entire time were perfect. And yet, our prints were still terrible. Something was missing. Lia went back to painting her negatives for the piece with Jenny, which itself must be amongst the most meditative tasks in her arsenal of support tools…until she might occasionally remember the one that was ruined during this same period of turmoil because the cat got in and danced all over it. If you’re going to go through all of this to create something as incredibly beautiful as it is meaningful, perhaps meditation is the only way to stay sane. As an anti-climatic end — and only so because I missed the single best day of printing when apparently everyone in East Los Angeles showed up to help with the process — Lia, Jenny, Garret, Jorma, and even two other new additions to the team were all there to discover the issue was, in fact, the paper. A paper we ordered that was made by the same manufacturer, but in a more convenient size than the one Lia had originally used, was in fact the culprit behind all of our weeks of agony. And with this discovery comes the end to your own agony. Everyone is happier, in ever-increasing spirits, and we apparently have our first prints — or so I hear. Expect some more uplifting accounts in the coming weeks. But it’s worth noting that no matter how much you plan (from measuring the size of wash bins you’ll need for rinsing the prints and creating negatives in advance that get ruined because of a cat’s curiosity — what a cliché — to ensuring your mixture of chemicals is true and that your paper happens to be one that works well with the mixture you’ve chosen), you never know what can go wrong. Even the most certain aspects will turn to your most cruel and challenging surprises. You have to have the support, passion, and stamina to make it through those roadblocks. Consider this Lesson Two: you just can’t plan everything. With the precision (if not the artistry) of the graph-paper-armed architect, we had the perfect plan for building a contraption that would allow us exacting control over the exposure of what would be Lia’s first, large-format cyanotype prints for her series, Your Body Is a Space that Sees. Henrietta is the largest lighting system I've ever built. I can't imagine building one larger for any real, practical purpose. With a diagram that took longer to slap together in Photoshop than it should have, Garret and I headed to Home Depot to grab everything we would need. We spent the next forty or so man-hours putting together Henrietta, as we soon called her, after astronomer Henrietta Swan Leavitt (from hard drives to cameras to Wi-Fi networks and passwords, everything is ultimately sworn into duty with a name fit for Your Body Is a Space that Sees). Leavitt was a Harvard College Observatory “computer” back when that was an appropriate title for a human. Her turn-of-the-century work in computing the brightness (or luminosity) of stars and the relationship between luminosity and the period of Cepheid variable stars laid the groundwork for future astronomers to measure the distance between far-away galaxies and Earth, which greatly aided Edwin Hubble in his discovery that the universe was expanding. By the time we finished putting her together, Henrietta was truly a beast. The two-by-fours we had selected for her construction were, admittedly, complete overkill. In order to support this weight, we had attached four grotesquely large blocks for her legs. We had some nifty locks fashioned into all the right places to keep the unit somewhat workable in practice. But ultimately, Henrietta resembled nothing of her namesake, who was certainly more swan-like than the Frankenstein of a machine we put together. Want something overbuilt? Leave it to two, twenty-something, over six-foot-tall, well-meaning but rather passionate guys. When all was said and done, Henrietta was a name we had barely begun to get used to before our first tests proved to us that the ultraviolet lights we put into this contraption were far too dim to be of use to us. Of course, there is a good reason that we didn’t first test one small print with a single, fluorescent UV light before going through the expense or time commitment of actually building Henrietta. Scientifically, this profound reason is referred to as human error. Put more colloquially, we screwed up. Perhaps it was the name choice itself that doomed us from the beginning. But it was only in hindsight that I realized the irony of Henrietta’s unfortunate lack in brightness. The Cepheids Leavitt measured over 100 years ago remain over 100,000 times more luminous than our sun, but we could not coax Henrietta into producing enough light for a single cyanotype within any reasonable amount of time. Consider this Lesson One: test, test, and test more. Garret kneels over Henrietta as we patiently wait over forty minutes for her to produce some tangible prints that prove her existence necessary. By this point, we had propped our test print up with books to decrease the distance from the lights, thereby increasing their intensity/effect. My research trip out to Harvard to source the history and visuals for 'Your Body is A Space That Sees' landed me in one of the most unique archives one could imagine, the Stellar Glass Plate Collection. The unique collection founded by Edward Pickering in 1880 is the largest of its kind on earth with over half a million glass plates cataloging the night sky. Housed in endless rows of metal cabinets resides the plates, most of which are 8x11 inches, and 11x14 inches, each protected by a paper jacket with notations from various astronomers, including the group of women known as the Harvard Computers. Pickering was eager to use astrophotography to capture images of the entire night sky so that spectra, galaxies, stars and nebula could be studied more carefully and to eliminate hand drawn mages previously made by astronomers. One of the most incredible assets to the collection is a daguerreotype of the moon from 1848, the very first photographic image of the night sky which I was lucky enough to view when carefully unwrapped by the curator Alison Doane. The digitization of the Harvard Astronomical Plate Collection will provide the capability for systematic study of the sky on 100 year time scales. Amazing experience flying solo after many months of lessons with David Werntz in the Aero Association of CalTech/JPL. Completed 3 take off and landings on Skyhawk 19760 and was giggling the whole time. Onward and upward a few steps closer to a pilots license! The Harvard Archive Collection houses personal photographs, journals and letters recounting of Annie Jump Cannon's astronomical travels to the telescope in Peru and many adventures to view solar eclipses. In addition to some pretty incredible images from Mt. Hamilton's Lick Observatory in 1889 there was also two beautiful cyanotypes of Annie riding a horse up to the top of Mt. Wilson Observatory, Los Angeles in 1913. Your Body is a Space That Sees is series of cyanotype prints that sources historical imagery and narratives to trace contributions of women in astronomy since antiquity. 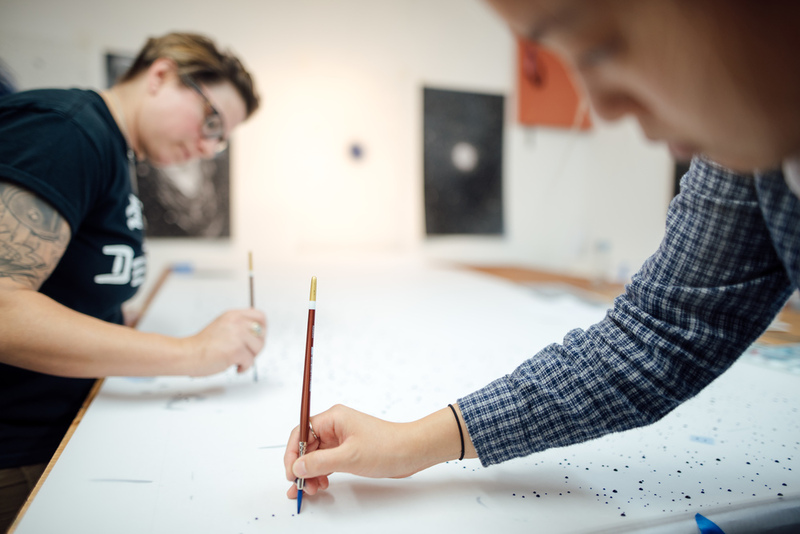 The of series of large scale cyanotype prints will interpret a fragmented history and represent a female-centric astronomical catalog of craters, comets, galaxies and nebula drawing from narrative, imagery and historical accounts of Hypatia of Alexandria, Caroline Herschel, Helen Sawyer Hogg, and a group of women at Harvard in the late 1800’s known as Pickering’s Harem or the Harvard Computers. Cyanotypes are printed from painted negatives that are based on the objects and narratives that were connected to these early astronomers. This process mimics early astronomical glass plates moving between transparent surfaces to a photograph without the use of a camera. 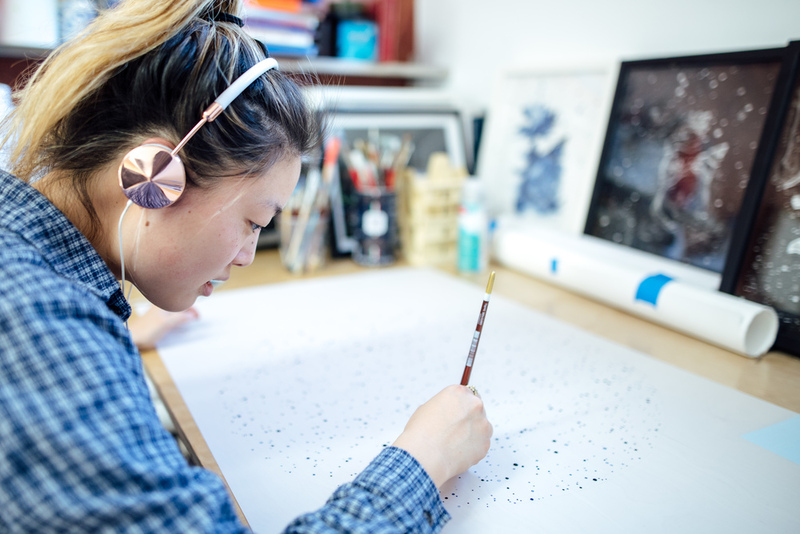 The series of photo/painting pieces will be accompanied by an exhibition catalog with written contributions about the night sky from women in literature, poetry and physics. Research of source imagery will include the extensive glass plate collection at the Harvard College Observatory (HCO). This project has been generously supported by an Art Works Grant from the National Endowment of the Arts in partnership with Chapman University.